Before Studying what are capability curves of synchronous generator, let us first discuss about rating of generators and its compounding curves. The heating is a key factor in deciding the rating of alternators, transformers etc. The heating is caused by losses so ultimately rating of machine depends on losses. These losses are independent of load p.f. as I2 R losses depend on current while core losses are dependent on voltage. Thus the rating of a.c. equipments is decided by the volt-amperes of the load it can supply and not on load power only. In case of turbines and boilers in hydroelectric and thermal stations, their sizes, water and fuel requirement depend on output power. The rating of synchronous generators is specified interms of maximum apparent power in KVA and MVA load at a specified power factor (normally 80, 85 or 90 percent lagging) and voltage for which they are designed to operate under steady state conditions. This load is carried by the alternators continuously without overheating. With the help of automatic voltage regulators the terminal voltage of the alternator is kept constant (normally within ±5% of rated voltage). The power factor is also important factor that must be specified. This is because the alternator that is designed to operate at 0.95 p.f. 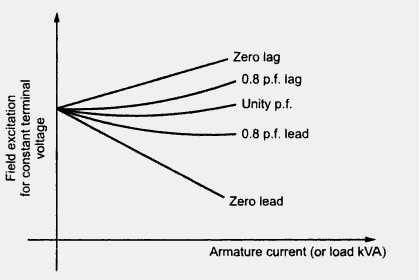 lagging at rated load will require more field current when operate at 0.85 p.f. lagging at rated load. More field current results in overheating of the field system which is undesirable. For this compounding curves of the alternators can be drawn. To maintain the terminal voltage constant the lagging power factors require more field excitation that that required for leading power factors. Hence there is limitation on output given by exciter and current flowing in field coils because of lagging power factors. The ability of prime mover decides the active power output of the alternator which is limited to a value within the apparent power rating. The capability curve for synchronous generator specifies the bounds within which it can operate safely. The loading on generator should not exceed the generator rating as it may lead to heating of stator. The turbine rating is the limiting factor for MW loading. The operation of generator should be away from steady state stability limit (δ = 90o). The field current should not exceed its limiting value as it may cause rotor heating. All these considerations provides performance curves which are important in practical applications. A set of capability curves for an alternator is shown in Fig. 2. The effect of increased Hydrogen pressure is shown which increases the cooling. When the active power and voltage are fixed the allowable reactive power loading is limited by either armature or field winding heating. From the capability curve shown in Fig. 2, the maximum reactive power loadings can be obtained for different power loadings with the operation at rated voltage. From unity p.f. to rated p.f. (0.8 as shown in Fig. 2), the limiting factor is armature heating while for lower power factors field heating is limiting factor. If the alternator is operating is constant terminal voltage and armature current which the limiting value corresponding to heating then the operation of alternator is at constant value of apparent power as the apparent power is product of terminal voltage and current, both of which are constant. The above equation represents a circle with center at origin and radius equal to Vt .Ia. Similarly, considering the alternator to be operating at constant terminal voltage and field current (hence E) is limited to a maximum value obtained by heating limits. This equation also represents a circle with centre at (0, -Vt2/Xs). These two circles are represents in the Fig. 3 (see next post as Fig. 1). 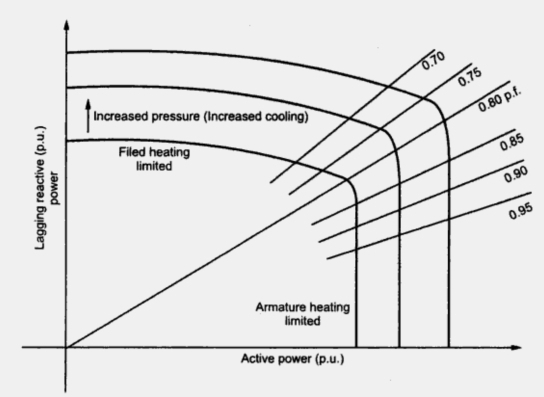 The field heating and armature heating limitation on machine operation can be seen from this Fig. 3 (see next post as Fig.1). The rating of machine which consists of apparent power and power factor is specified as the point of intersection of these circles as shown in the Fig. 4. So that the machine operates safely.